When I graduated with my bachelor’s degree in 2006, I swore I would never do another day of school. I love learning, but I hate homework with the fire of a thousand suns. However, in 2009, an opportunity presented itself that would allow me to earn my master’s degree from the comfort of my own home, and I would have been foolish not to take it. The Idaho Commission for Libraries (ICfL) worked out an agreement with the state libraries of Montana, South Dakota and Wyoming that created a learning cohort, nicknamed SWIM. This was for the University of North Texas to provide a way for interested librarians to get their master’s degrees online. I was highly encouraged by several people to apply for this program, and so I did. I was fortunate enough to earn a scholarship that eventually paid for all of my tuition. This was an opportunity that you just don’t turn down, and so, with trepidation, I found myself back in the world of academia. I’m not going to lie, the first semester was pure hell. There were many times I felt I had made a huge mistake in going back to school, and not only was I not going to excel, but that I was going to fail miserably. I know I’m not the only one who felt this way. For me, it had been a scant four years since I last hit the books. For others, I know it had been many more years. Many of us had fulltime jobs, families, and religious and community commitments. How were we going to get through this? On August 18, 2012, I graduated with my Master’s Degree in Library and Information Science. I am proud to report that I earned an “A” in each class, and I aced the final week of tests. When my year anniversary came a few months ago, I started to reflect on grad school and some of the things that helped me get by. I hope that this advice will help those who are nervous about going back, or to those who have just started and are feeling as inadequate as I did. 1. Find your support group. One of the only reasons I got through grad school is because my husband helped me in any way he could. He cooked, he cleaned, and when we had our daughter, he spent endless hours taking care of her so I could focus on getting homework done. He was my rock. I was also fortunate enough to have three of my coworkers and a close friend of my mother-in-law also in the same program, so I was able to rely on them when questions arose about specific assignments. It doesn’t matter who your support group is (family, friends, drinking buddies, etc. ), just know who to turn to when the need arises. Grad school is stressful, and it’s nice to have someone who will listen when you need to vent, or help you keep your sanity as you try to juggle school with life. 2. Find the classmates and the mentors who can help you. I’m going to let you in on a little secret. There are some really bad students out there, ones who don’t check in that often on group work, or who will write the most inane comments on your work that you’ll want to pull your hair out. Fortunately, I only met a few of them throughout my time at school, and I can tell you from personal experience that there is nothing more frustrating than someone who won’t pull his or her own weight. On the flip side, there are really good students out there, too – ones who take charge, have insightful comments, and are really good spellers. My hope is that all your classes will be filled with the latter type. I know this won’t always be the case, though. Strive to find those good students, or – better yet – become that student. Your fellow classmates will thank you. As part of our SWIM agreement, all those who received scholarships agreed to become mentors to other students who are pursuing MLS degrees. In addition, there are other librarians throughout the state who have agreed to become mentors. For that information, contact Shirley Biladeau at shirley.biladeau@libraries.idaho.gov or (208) 639-4149. She will put you in contact with one of us, and we are more than happy to help you, even if it’s just a shoulder to lean on. Also, if you’re attending the same school we did, we can tell you which classes are really worth taking. 3. Find the time to get your work done. I think it’s very natural to procrastinate (or maybe I just think this because it seems like I’m the queen of procrastination). However, in grad school, procrastination will quickly become your enemy, especially if you’re completing an online degree. For me, because I was doing an online degree and I wasn’t going to a regular class, it was easier for me to think that I could play now and do my homework later. I found out that “later” needs to be today. It is so easy to put things off until the very last minute, but it’s not always the wisest course of action. I remember one time when my in-laws called me concerning a medical emergency, and they needed me to watch their daughters while they were in the hospital. I had a five page paper due the next day, which of course added to my already high stress of the medical emergency. I was up late that night, and had to be up early the next day to get the girls to school. Fortunately, I got the paper in on time, and I think it was somewhat coherent. Of course, we can never plan when emergencies are going to come up (hence the reason they’re called emergencies), but that is why it is even more important in grad school to not put things off. Also, you should carve time out of every day to get schooling done. I would start mine about an hour after I got home from work and went until I needed to go to bed. After I had my daughter and because she had a crazy sleep schedule, I found myself studying at random times during the day (and night). Find the time that is best for you and your life, and stay on top of things. 4. Find your stress release. This is my favorite thing to tell people. As stated before, grad school is very stressful, and I firmly believe that all students need to find the thing that calms them down the most. Maybe it’s a quick run, knitting, or cleaning. It doesn’t matter what it is, just be sure you have something you can do when school gets to be too much. My stress release was a punching bag, and this is how I found out that I needed one: In my first semester, which also happened to be my most stressful semester (mainly because I didn’t know what I was doing), I had to do a group project with some other classmates. Funny enough, I don’t remember what the project entailed, but I do remember that I was in charge of taking notes from our discussion and getting the whole project started. The next day, when I went to start the project, I couldn’t find those notes anywhere. My husband and I scoured the house, but we both came up empty. The pressure and the stress got a little much for me, and in frustration, I kicked the wall (I had wanted to punch it, but luckily I remembered my walls are pretty thick and I probably would have injured my hand). Then I burst into tears and sobbed for about five minutes straight. My poor husband was stunned and unsure what to do, as he had never seen me act this way. Eventually I was able to calm down and recreate the project from memory. We found a punching bag for me not too long after that. Anytime I became frustrated with schoolwork, I would go throw a few punches, and then get back to work. I know it sounds ridiculous, but it’s what worked for me. Sometimes, you just need to take a few steps back and do something that gets your mind off of whatever is stressing you out. I can hear your questions now: “What? Find time to relax? Didn’t you just say not to procrastinate?” Yes I did, but I also think it’s very important to take some time away from studying. Catch a movie, read a book, or do game night with friends. If I didn’t take a break every now and then, I’m pretty sure I would have gone crazy. Take a night off and remember what life was like before grad school started. Trust me on this: you’ll be glad you did. Grad school is not fun. Anybody that goes through it knows that. However, there is nothing like that feeling of accomplishment when you get that piece of paper that proclaims, “I did it. I finished grad school. Now I can have a life again.” But until then, to use a phrase I heard constantly during my own schooling, just keep swimming. You can do it. You can make it through. It will be hard and miserable, and at times you will wish a pox on your professors for assigning all of the reading and papers. All of us who have our degrees are rooting for you and we understand what you’re going through. Good luck. Beth Swenson is the Outreach Librarian at Twin Falls Public Library. Magic can happen when groups of dedicated educators gather together to share expertise, explore strategies for student success, and build upon the ideas of their peers. Magic did happen during two‐day workshops held this past summer in Idaho, Montana, Oregon and Washington. Funded by a grant from the Library of Congress, the Teaching with Primary Sources (TPS) program at NCCE offered two levels of professional development free of charge for K‐12 pre‐service and in‐service teachers. Level I introduced participants to the vast resources available at the Library of Congress, the primary source analysis process, and lesson development. 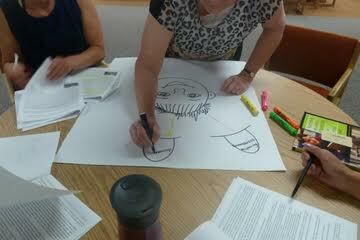 Level II expanded on Level I teachings and focused more directly on Barbara Stripling’s Inquiry Model. Both sessions had educators participating in “hands on” activities that included group discussion and time for personal reflection. One of the many activities during the workshop looked at the San Francisco Earthquake through a motion picture filmed at the time and provided two different newspaper accounts from opposite sides of the country. Participants discussed the issues of perspective and purpose and how a combination of primary sources could enrich and deepen understanding of a historical event. An additional activity looked at the Indian Removal Act of 1830 and how it violated the mandates of Constitutional Checks and Balances. A close analysis of primary sources explored the perspectives of Andrew Jackson, Chief John Ross, Edward Boudinot, and John G. Burnett as they either supported or challenged the act that lead to the “Trail of Tears”. Participants were to either validate or repudiate the Indian Removal Act by providing evidence of their position based on the primary sources examined. Historical thinking skills formed a foundation for many of the activities and discussions that took place during both levels of the TPS program workshops. Using resources from Stanford’s History Education Group, a TPS Consortium member, educators created info graphics that highlighted both the process and the skills needed to assess historical thinking. Info graphics were introduced as an alternate means of assessment as they involve both text and graphic representations of knowledge and understanding. The TPS program at NCCE workshops are taught by highly‐trained educators with many years of classroom experience. Activities presented are easily adapted to a variety of grade levels and subject areas. Many thanks go out to the teacher‐librarians and classroom teachers who have participated in the various workshops offered as their expertise and insights are greatly appreciated. With funds granted by the Library of Congress through 2014, opportunities to participate in the TPS program at NCCE will be available in the coming year. For further updates and information on the TPS program at NCCE visit http://www.ncce.org. To learn more about the Library of Congress Teaching with Primary Sources (TPS) program and other resources visit www.loc.gov/teachers. Stripling, Barbara. Library of Congress, “Teaching Inquiry with Primary Sources.” Accessed August 4, 2013. http://www.loc.gov/teachers/tps/quarterly/inquiry_learning/article.html. Stanford History Education Group, “Charting the Future of Teaching the Past.” Accessed August 4, 2013. sheg.stanford.edu. Kathy Dorr is a Professional Development Specialist at Northwest Council for Computer Education (NCCE). Libraries serve all types of people and knowing how to provide services to those with special needs is an important part of any librarian’s job. A growing number of youth in America have a developmental disorder that falls within the autism spectrum: autistic disorder, Asperger’s syndrome, Rett syndrome, childhood disintegrative disorder and pervasive development disorder. 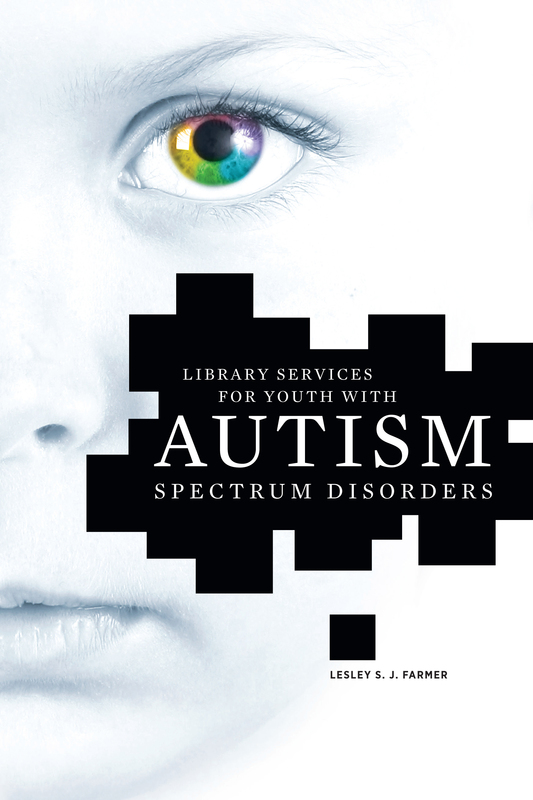 For library personnel who work with youth who have autism spectrum disorders, L.S.J. Farmer’s Library Services for Youth with Autism Spectrum Disorders is a must-have tool. No matter if you work with youth in a school or public library, Farmer provides useful suggestions for every type of scenario. From an introductory-level understanding of Autism Spectrum Disorders (ASDs) to teaching youth with ASDs and behavior management techniques, Farmer paints a comprehensive picture of how librarians can help youth with ASDs. Of particular interest to both school and public librarians is how to provide a positive social structure to help youth with ASDs develop social skills and feel comfortable in social settings within the library environment. Farmer points out that one way to achieve this goal within a school library setting is to allow youth with ASDs to serve as library aides, and that, “being a library aide should have a social dimension to strengthen group identity and foster cohesion” (139). All types of library programs, from literacy-centered activities to maker-oriented ones can involve youth with ASDs and help them to foster new social skills. Farmer also provides tips regarding how to navigate the sometimes emotionally-charged world of youth with ASDs, including how to help them self-manage their emotions and move toward emotional growth and independence. In addition, Farmer provides lists of resources that librarians can use, both with youth with ASDs, as well as those who work with them. Training ideas and applicable resources about how librarians can incorporate the principles of universal design when working with youth with ASDs, will help library staff provide better services to this special population. A historical and legal framework of how federal laws apply to those with ASDs, and how such laws affect libraries and library services, is a much-needed guide for all library workers. Lastly, the appendix of resources (consisting mostly of websites), bibliography, and glossary, provide an extension to the many helpful tips and resources presented by Farmer. Overall, this book is a practical tool that libraries of all types and sizes should make available for staff training purposes, so that youth with ASDs are provided with the best possible library services. Gena Marker is a Teacher-Librarian at Centennial High School, Joint School District No. 2 in Meridian. Have you ever been a part of a team where everyone just clicks and works together to accomplish much more than you could as individuals? Whit Mitchell has, and his Working in Sync takes his experience as a freshman crew coach at Dartmouth University and applies lessons learned to a business environment. The book profiles eleven men who met over the course of the 1982-83 academic year at Dartmouth University and came together to form a successful crew team. Though some of them had never rowed or even played sports before, the young men who began the year as strangers went on to beat the highly regarded Yale team later that year. But as Mitchell argues, that year simply represented an early step in the course of eleven very successful lives. He isn’t the first person to draw a connection between collegiate athletic achievement and professional accomplishment, but his personal profiles and sermonic wisdom from each help set Working in Sync apart from the general pack of business and leadership books. Mitchell himself serves as a consultant to business executives and collegiate and professional athletes. While this book will resonate best with readers familiar with these areas of experience, many of its insights about leadership and character are generalizable to almost any sort of team or group environment. And while some of the men profiled have success in business, others work in areas such as nonprofits and medicine, so the book also has lessons for people who rarely wear three-piece suits. 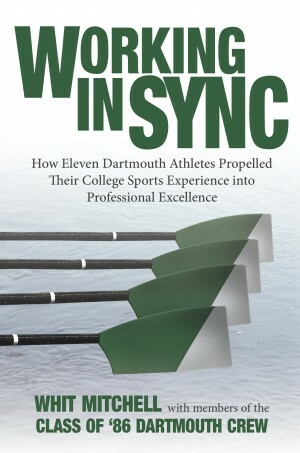 Each chapter focuses on one of the eleven Dartmouth student-athletes, opening with some basic biographical information followed by a brief description of the person’s experience with Dartmouth’s crew team (Mitchell largely avoids confusing crew jargon, and includes a brief glossary of certain terms following the book’s introduction). We also get a look at the man’s professional life, and Mitchell ends with a lesson from the subject’s crew or work experience. Topics vary, covering individual values, such as perseverance and accountability, and group ones, such as soliciting input from team members and investing in people. He also suggests ways to follow up or reflect on these lessons, including discussion questions and activities. This format makes the book a natural fit for a book group approach. These profiles are frequently inspiring, so it’s perhaps a disappointment that the book doesn’t go into more detail about the individuals themselves. When reading about people like Hans Stander and Sam Hartwell, who have led efforts to invest millions in impoverished areas of the world, you can really see why Mitchell is so proud of having been involved with this group. At the same time, this brevity makes Working in Sync suitable for working professionals who might not have time for a longer book. Whether read in one sitting or over many weeks in a group setting, the book will encourage all readers to be conscious about how they work as part of a team, and how much those teams can accomplish when they work together with the coordination of a skilled crew. This book is probably best suited to corporate libraries, although it will likely be valuable at public libraries as well. A single copy on the shelves in an academic library may not prove particularly useful, but it would likely supplement the curricula of business courses in higher education.